Last night Toronto had yet another storm for the ages. I had a front row seat, but didn't see much between cooking supper, doing laundry and cowering behind the couch. Thankfully, Jon Simonassi was far braver and made this great video. Despite having a view of CN Tower, I still didn't feel like craning my neck out into the storm to watch for lightning strikes (though, as the largest lightning rod this side of Chicago, it gets hit often). I did however catch a few amazing lightning shards hit the Lake. It's sort of wildly beautiful and frightening all at the same time. I suppose I should have been watching for funnel clouds as Toronto, along with much of the Golden Horseshoe (more like a Golden Barbecue this summer) was under an official tornado watch from Environment Canada. Some of the thunder claps were incredible. 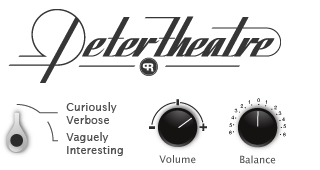 Completely deafening and um... pant soiling. No matter what your brain tells you, when you hear a sudden noise that loud, your heart goes immediately into "flight mode", making me wonder are there more heart attacks during thunderstorms? (Based on a quick Web search – more sleep apnea and asthma but no extra cardiac events.) I did notice something strange after the storm but I thought it might just be me. There seemed to be a sort of metallic smell, as though someone had just sanded a steel pipe with steel wool, if you know what I mean. Some people describe it as fresh but I would't put it that way. According to Nova, it's the smell of Ozone or O3 which is abundant following an electrical storm. 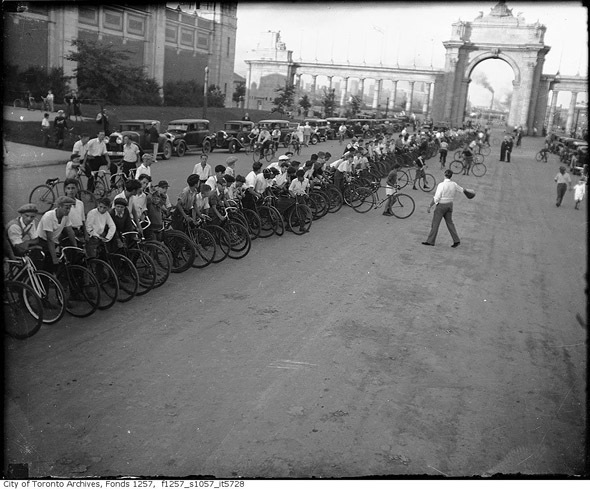 Toronto used to be more bicycle friendly, as this photo from the 1930 CNE attests. See more at BlogTO. In Ontario (I can't speak for other Canadian cities) everyone knows, summer begins to end when the "Exhibition" comes to town. In Ottawa, it's known as "The X" or "The Ex" (depending on the current marketing campaign). Whereas in Toronto, it's called the CNE, short for the Canadian National Exhibition. How grand. I can't remember what we called the one that appeared in the Avalon Mall's parking lot in St. John's. The Midway, the Fairgrounds? Midway sounds right. Right? So that's it. At 10 AM Eastern Standard Time, August 19th, the end of summer begins. At the same time it's the official close of the sale of 112 Fern Avenue. A summer of house sales, house builds, house moves and endless, endless trips back and forth. I'll always think of it as "The Summer of a Thousand Cuts" (as in "Death by a thousand cuts"). A summer of endings and beginnings. At times it seemed like a cruel "Groundhog Day" version of an Endless Summer. It certainly was the summer of our discontent, in the real sense that all of my "discontent" was in full bloom. Of course, summer really ends with the explosive, howling Air Show on the Labour Day long weekend. If I could escape the city for a weekend, that would be it. Though Caribana would also be in the running. I recently heard a quote from MacBeth that seems fitting. "It is a tale, told by an idiot, full of sound and fury, signifying nothing." Yeah. Full of sound and fury. Signifying nothing. That's life. I've been thinking a lot about swimming lately, particularly as I've been too busy to go this week (I usually swim two to three times a week). Not swimming, especially in the summer is rough for an enthusiast such as myself. As an enthusiast, I'm prone to mentally collect lists of films that touch on my chosen diversion. You know what I mean. I cycle a lot, so I note any movie where bikes play a part of the story (think of Breaking Away, or of the cycling montage in Butch Cassidy and the Sundance Kid or even The 40-year-old Virgin – where Steve Carrell is caricatured by his use of a bike). If you love hockey, you might list Slapshot or Mystery Alaska in your cerebral library of hockey movies (you’ll probably try to forget Rob Lowe’s Youngblood). Relax. We'll have a swim. Feel better. I’ve started to do that same thing with swimming, not just the obvious ones like Swimfan, Big River Man or The Swimmer but ones where a character is shown doing laps in lieu of a “long thoughtful walk on a beach” or something. I guess the idea is we can “see” a character thinking while a voice-over or inspirational music plays. The two scenes that come to mind are decades apart but similar (because they are in a pool – that’s about it really). This New Yorker cartoon is an accurate depiction of my current state of mind and body. Recently I saw Public Bikes had a call for customers to submit ideas for products they should carry. Ideas for things they would sell don't seem limited to bike accessories but in my mind, that is what they do best.